Original pieces of art will be on sale March 16 at the 39th Annual Art Auction March, sponsored by Friends of Art Southern Illinois University and the Department of Art & Design at SIUE. The auction will be held in the Art West Gallery located in the Art and Design West building on the SIUE campus. Doors open at 6 p.m. and Ahrens & Niemeier auctioneers will start the bidding at 7 p.m. Original artworks have been donated by faculty, visiting artists, alumni, friends and advanced students. Additional work will be available to the highest bidder in a silent auction. To view images of the artwork, visit Friends of Art SIUE on Facebook or attend a preview in the gallery from 10 a.m.-4 p. m. Tuesday, March 15 and from noon-4 p.m. Wednesday, March 16. Since l977, Friends of Art SIUE has assisted the department in staging this fund-raiser. Last year’s auction allowed the department to invite 29 local, national and international artists and lecturers to the University, as well as provide funds for students to attend national conferences and awards for student exhibits. Tickets are $7 for the general public and can be purchased at the door. Admission is free to all students and those who have donated works for the auction, as well as members of the Friends of Art. Free food will be provided as long as it is available. There will also be a cash bar. Free parking will be provided in Pay Lot B (SIUE’s Visitor’s Lot). Although parking will not be available adjacent to the building, attendees may be dropped off at the doors behind the Art and Design West building. For more information, visit Friends of Art SIUE, their Facebook page or friendsofart.siue@yahoo.com. 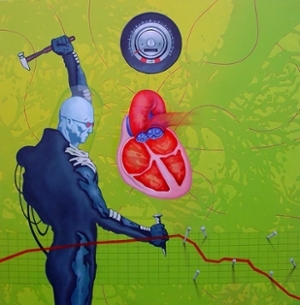 An oil panel, “Pacemaker,” was created by Jason Bly, established instructor in the Department of Art and Design. 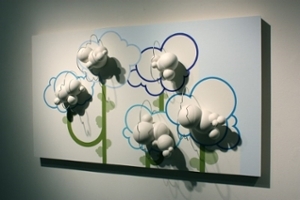 “Panel Series” is part of sequences of ceramic pieces was crafted by Joseph Page, assistant professor in the Department of Art and Design. This sterling silver and stone pin was designed by Aimee Howard, assistant professor in the Department of Art and Design.